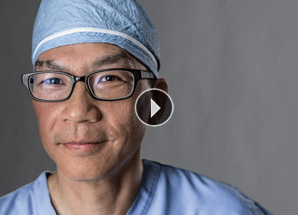 Neurosurgeon Mark Li, MD, PhD, and our team of brain tumor specialists know how to find and treat brain tumors while also preserving each patient’s quality of life. This approach includes treatments such as awake craniotomies that do not disturb speech or movement, along with technologies such as Gamma Knife® Perfexion™. Our team has performed more than 12,000 neurosurgeries over the past decade. Our collaborative and compassionate team will design the best treatment plan for your brain or spinal tumor. Your diagnosis and treatment plan is reviewed by a team of medical specialists that includes physicians from neurosurgery, radiation oncology, medical oncology, neuroradiology and neuropathology. Our team is dedicated to improving both survival and quality of life for people who are diagnosed with central nervous system cancers. For more than 30 years Gamma Knife® has been the gold standard in radiosurgery, offering a safe, precise option for treating cancerous and non-cancerous conditions of the brain. Gamma Knife® Perfexion™ can treat even more – andharder to reach – tumors, and Lehigh Valley Hospital-Cedar Crest is the first in the area to offer this sophisticated technology.